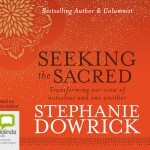 Just published is the audio edition of Dr Stephanie Dowrick’s intimate, inspiring book, Seeking the Sacred, described by Claire Scobie in the Sydney Morning Herald as “A chalice of wisdom”. 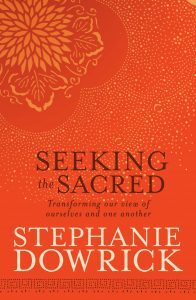 Whether you are a “seeker” or simply curious, this book speaks to some of our most pressing concerns, socially and personally, about what constitutes a more generous, rewarding life. Strong also on memoir and story, it lends itself particularly well to the personal voice of the author, and the intimacy of Stephanie Dowrick drawing out themes that touch all our lives. 12 hours; 10 CDs, beautifully produced at the Bolinda studios in Melbourne. Postage on books ordered via Seek is $6.95 for unlimited books/CDs. Previous Previous post: How to save your marriage!